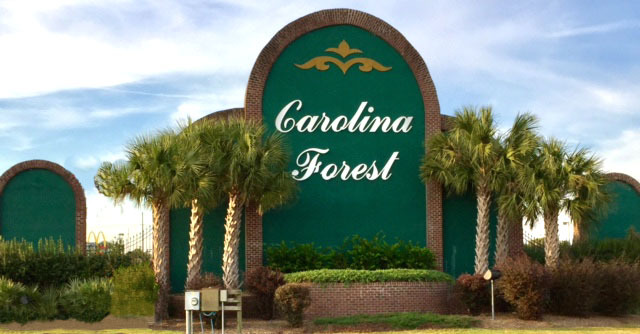 Carolina Forest is a 9000-acre master-planned community that is located on the outskirts of Conway off Highway 501. Consisting of many neighborhoods that range from affordable to water-front mansions, Carolina Forest has proven itself to be one of the most popular and coveted communities in the entire Grand Strand. Even our well-known celebrity "weather man", Ed Piotrowski, calls CF home. He proudly posts photos of sunsets and sunrises in his Plantation Lakes neighborhood on Facebook. There are many reasons why Carolina Forest is a great place to live. For those with kids, the primary reason is the award-winning schools that are the best in the state. Convenience is another; this community is almost like its own town. There are stores, doctor and dentist offices, banks, gas stations, and restaurants that are as close as a short walk or drive, depending on which part you're living in. There are lakes, the Intracoastal Waterway, walking trails, community pools, and other recreational amenities as well. Myrtle Beach and the ocean are only a few miles up 501, as are Broadway at the Beach, the Coastal Grand Mall, and all the restaurants you could ever want. If your teen intends to go to Coastal Carolina University or Horry Tech, they can live at home and be 10-15 minutes from school. And there are no city taxes in Carolina Forest! Golfers will be surrounded by their favorite hobby! The Man O'War, Wizard, and Witch courses are found in the community, and Legends is just down the Highway. Whether you are looking for an inexpensive home with a country feel, or a luxury waterfront mansion with a private dock on the ICW, you'll find it in Carolina Forest. We have every neighborhood described and pictured on our big C21TheHarrelsonGroup.com website. Decide which one is made for you, and contact us for a tour or more information.